(Source: ETNZ) Three elements of the wing were extensively damaged. One will be repaired overnight, one has been bought from the event and one will be cannibalised from the Youth America’s Cup AC45. Skipper Dean Barker vowed the team would be back on the water for the second day of the America’s Cup World Series final regatta for the 2011-12 season. The capsize occurred at the top mark during the first quarter-final race against Luna Rossa Piranha. 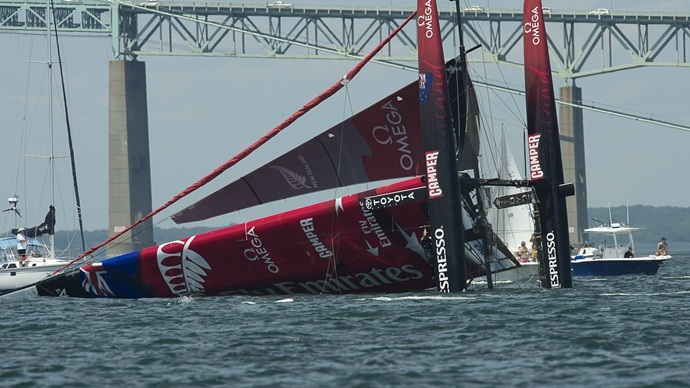 Emirates Team New Zealand was comfortably ahead. A problem with the leeward runner meant they could not ease the wing sheet as they rounded the mark. Able to go either up or down, the capsize was inevitable. Coach Rod Davis, in a chase boat alongside the yacht, blogs his take on the incident. So we had to re-capsize and start all over again. Three snapped tow lines and a pad eye later (the back of the chase boat looks like someone has beaten it with a chain) we had the cat back on her paws. And the boys sailed it home. So what happens now? There are three flaps on the back of the wing. One is can be fixed overnight, one can be fixed but is not over night. And the last is totally destroyed. 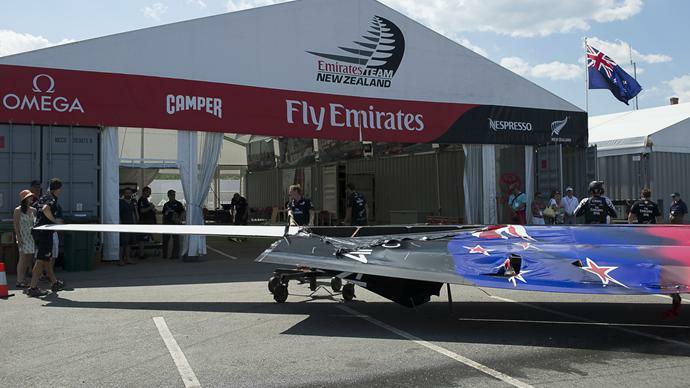 The wing might look a little funny in the branding but we will be back on the water tomorrow.